The LMH2 product line allows SSL makers to deliver a broad range of lumen packages in the same led lights housing and now offer products that dim from 2700K to 1800K to mimic halogen incandescent performance. Cree has announced what the company calls Sunset Dimming in its LMH2 LED module family. The new module line dims from a 2700K CCT at full brightness to 1800K at 1% of full range, and maintains a 90 CRI over the bulk of that range. The new dimming capability provides led lights makers with even more options that they can offer using the same basic fixture design. The LMH2 line of products has been among Crees lighting products that feature TrueWhite technology implying a CRI above 90. In the case of the modules, the TrueWhite implementation includes a mix of white LEDs that are above the black-body curve along with red LEDs. That mix provides both good efficacy and the ability to offer a warm CCT and high CRI. The Sunset Dimming technology leverages the LED mix to increase the percentage of red energy relative to white energy as the light level drops. Cree implements that capability in electronics integrated within the module separately from the external constant-current driver required for the LMH2. LED lights makers can buy drivers from Cree or from third-party driver manufacturers on Crees approved vendor list. Cree expects the Sunset Dimming modules to find use in fixtures targeted for hospitality settings including restaurants and bars, theaters, and conference and reception halls. The product will also be used in high-end residential fixtures. The product can serve such a broad range of applications in part because of the fact that it uses an external driver. Proper driver selection will allow compatibility with triac and other phase-cut dimmers. Meanwhile, other available drivers support dimming schemes such as 0–10V or DALI (digital addressable lighting interface). The target applications largely share a common trait, according to Cree product marketing manager Paul Scheidt. He said, "They all still use incandescent technology." Despite more-efficient options such as compact fluorescent lighting (CFL) and ceramic metal halide, the target markets remain almost exclusively lit by incandescent sources because before the recent surge of dim-to-warm LED technology, nothing could match the incandescent ambience. Of course, the market will judge Crees dim-to-warm implementation compared with competitors. "Crees LMH2 Sunset Dimming is the best implementation of Sunset Dimming that we have found on the market today," said Fred Farzan, president of Nora Lighting. "Our customers really like the color quality and natural dimming the LMH2 Sunset Dimming provides. The LMH2 module with sunset dimming opens up new markets for us and allows us to address applications that traditionally use incandescent and halogen light sources. The LMH2 family, within the same form factor, now includes 850–4000-lm modules with standard dimming that Cree now calls WhiteLight. The Sunset Dimming modules only go to 3000 lm for now. But that span covers a broad range of applications, including in ceilings as high as 40 ft where 70W high-intensity discharge (HID) sources have been the only choice. "The Cree LMH2 LED module enables us to address a wide range of lighting applications with a single platform, providing investment protection," said Kenny Eidsvold, president of Intense Lighting. "We recently launched a new product line based on the 4000 lumen LMH2 LED module. 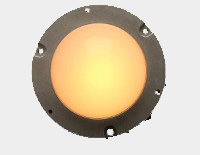 Now with the introduction of Crees sunset dimming option, we can further expand our product line to offer quality LED lights solutions for hospitality, restaurant, and residential applications." According to Scheidt, the new modules come very close to matching incandescent performance. Cree has documented that CRI remains above 90 down to 2170K and is still above 80 at the lowest level. The 2170K CCT occurs at about 12% of maximum output. A 13W LED module can deliver the same 1250 lm as a 150W incandescent lamp. But the story on energy savings gets even more interesting when you consider dimming. About incandescent lamps, Scheidt said, "At 50% light output, you are still using 75% of the power." Moreover, he pointed out that in many of the target applications, the lighting is dimmed a majority of the time its operating. So users will save even more energy with LED lights that dim mostly linearly with light level.